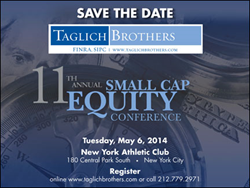 Air Industries Group, Inc. is pleased to announce that Peter Rettaliata, President & CEO and Michael Recca, CFO of Air Industries Group, Inc. (OTCBB: AIRI) will be presenting at Taglich Brothers 11th Annual Small Cap Equity Conference May 6, 2014. Air Industries Group, Inc. is pleased to announce that Peter Rettaliata, President & CEO and Michael Recca, CFO of Air Industries Group, Inc. (OTCBB: AIRI) will be presenting at Taglich Brothers 11th Annual Small Cap Equity Conference May 6, 2014. The Conference will take place at the New York Athletic Club, New York City. To request additional information or to register, contact Taglich Brothers at 212-779-2971 or visit http://www.TaglichBrothers.com. Air Industries Group, Inc. (OTCBB: AIRI) is an integrated manufacturer of precision equipment assemblies and components for leading aerospace and defense prime contractors. Air Industries designs and manufactures flight critical products including flight safety parts, landing gear and components, arresting gear, flight controls, sheet metal fabrications and ground support equipment. http://www.airindmc.com.